I don’t think that I would ever not want to live in a coastal city in Mexico without at least a month or two in low season, which runs from June to November. If you are considering retiring to Mexico, you especially need to spend some time there in whatever would be considered off-season in the places you're visiting. Summers hold a special charm. Yes it is hot. Oh-so-hot. Or more accurately, so humid. When I open my bedroom door in the morning from my air conditioned room to the unconditioned hallway, the humidity hits me like walking into an warm wet blanket. On the 12th floor, my apartment has seen a little action during storm season. I doubt there is a woman in America who has ever been casually asked by someone she barely knew to pick out and buy some bathing suits for her. I came to discover that our day wardrobe would consist of bathing suits and you need a lot of them. In spite of the heat though, the biggest reason why I will never want to miss the summer in a Mexican coastal town is the thunder storms. Many people who stay Mazatlán only in high season think it doesn't rain here. Lightning explodes behind thin veils of clouds. Like Kabuki Theater, defined by dramatic entrances and exits off stage, individual meteorological dramas light up different corners in the distant sky. What makes it unusual is that while these patches of lightning are small in reference to the grand scope of the sky and far away, you can see them with an astounding level of detail. With the view framed by the door, I watch different parts of the sky light up with heavenly syncopation accompanied by rolling shock waves of thunder and huge lightning bolts. There are climatic cracks of thunder and the roar of tropical rain on the roof. It’s like making love all night. You are exhausted the next day, but it’s worth it. Most recent: A most unreliable corporate manifesto. Next Up: Why handling money is so difficult when you are brand new. 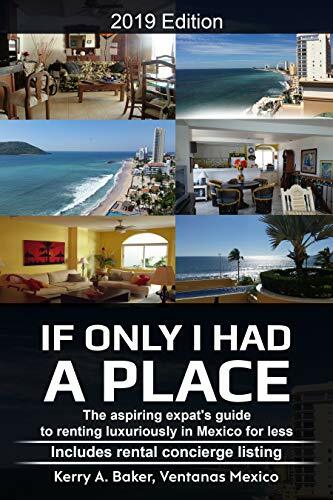 Kerry Baker is partner with Ventanas Mexico, which provides insights and resources to those considering expat life in Mexico, including "If Only I Had a Place" on renting in Mexico, luxuriously for less, geared for the aspiring expat. She is the author of the "Interactive Guide to Learning Spanish Free Online," a curation of free online language tools to prepare for life in a Spanish-speaking country.